Let’s talk metaphors. (“Parables”, if you’re Biblically inclined.) A person, on the basis of some intellectual analysis or subconscious revelation, starts a religion. Think of it as a fish. The religion is successful – the fish eats and grows. All that food passing through its mouth attracts a parasite that decides to live off the fish. The parasite has eaten and replaced the fish’s tongue, and now does the tongue’s work for the fish. The tongue-eating louse is a parasitic crustacean. It enters fish through the gills. The female (who grows up to an inch long) attaches herself to the base of the tongue, and the male (up to half an inch) attaches to the gill arches beneath and behind the female. The louse extracts blood through the claws on its front, causing the tongue to atrophy from lack of blood. 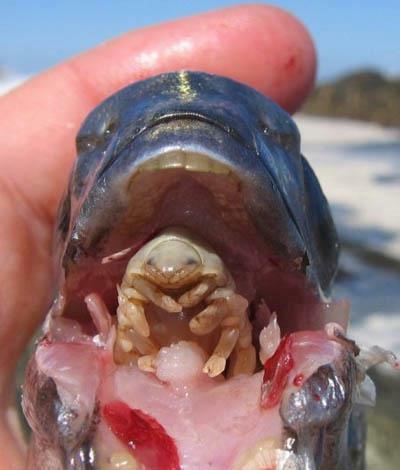 The parasite then replaces the fish’s tongue by attaching its own body to the muscles of the tongue stub. The fish is able to use the parasite just like a normal tongue. It seems the parasite doesn’t cause any other damage to the host fish. Once these lice replace the tongue, some feed on the host’s blood and many others feed on fish mucus. This is the only known case of a parasite functionally replacing a host organ. There are many species of Cymothoa, but only C. exigua is known to consume and replace its host’s tongue. That’s how a spiritual insight evolves into an organized religion. The guy sitting on the throne may not be part of the original concept at all.